Everyday I set a study time for the kids… And I take it seriously as I do plan out the lessons that I give to the kids. That’s complete with books and other materials. 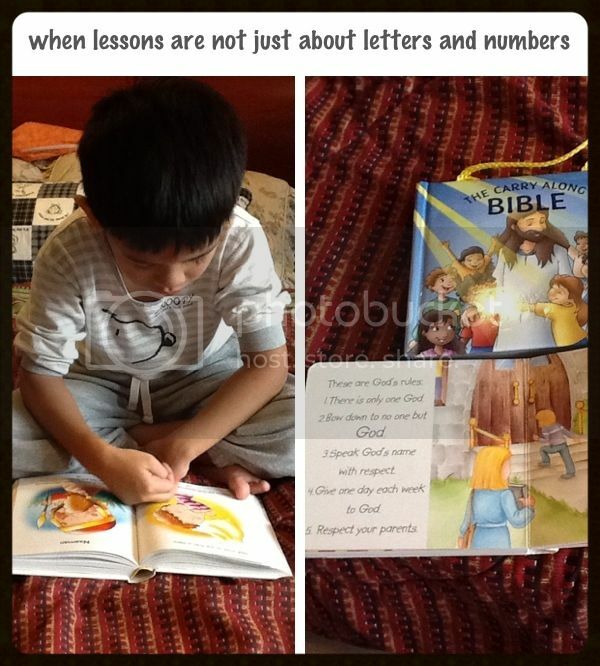 The 6-year old has always thrown faith-related questions my way since he was a toddler. He was the one who inspired hubby and I to make it a point to say our prayers before meals and during bedtime. As he grew, his questions also become harder to answer… add to that the fact that I am not a deeply religious person. He was referring to the priest (when we go to Catholic mass – I am Catholic) and the pastor (when we go to Christian service – hubby and kids are Methodist). The question would have been simple and a devoutly religious person would have a ready answer to that. Thanks to my upbringing, I gave him the correct spiel. But I carry my own prejudices. In retrospect, as I was answering his question, I can’t help but be reminded of people’s tendency to look up to, even idolize, religious leaders. Coming from the innocent questioning of his young mind, it brings an unbiased observation of the faithful’s tendency to violate the second commandment. And how easy it is to violate! Thousands flock to see esteemed religious leaders. Words of heavenly praises are given to those who are adored and idolized. In so doing, most of us -unintentionally, of course – would no longer see the one and only God. Instead, we see the religious leader there. And then, we hear disconcerting news about them. They who preach violate their own preaching. Yeah, I was very affected, thus this post. But I kept my thoughts to myself. My kids are too young and too innocent. Their faith is fresh and pure. Despite “myself”, they will go through their religious journey with optimism and innocence. I will be with them in their journey. But unlike other parents who are seemingly sure of their faith, I will be beside them and with them but I will be discreetly carrying my own prejudices with the hope that I go back to that “age of innocence” in so far as my faith is concerned.